Ayman al-Sanabani beamed as he entered his family’s home on his wedding day. He was greeting his new bride, Gamila, who was in a bedroom surrounded by friends. Ayman sat beside her for several minutes, receiving warm words of congratulations. It would be the young couple’s first and only encounter as husband and wife. The terrifying power of a bomb is how it can alter life so dramatically, so completely, so instantaneously. How it can crush concrete, rip apart flesh, and snuff out life. The moments before the pilot pulls the trigger and sends the missile screeching down choreograph the final dance with fate: another step forward into a room, a turn around a corner, a walk outside to get some air — trivial actions that determine everything afterward. This power is a fact of life in Yemen now. It is brought forth by a coalition of Arab countries led by Saudi Arabia and supported by the United States. The airstrikes have been relentless since March, a period now of eight months. They are supposed to be targeting a local rebel group, but appear largely indiscriminate, regularly hitting civilian targets. Thousands of people have been killed. Human rights groups say some of these strikes amount to war crimes. 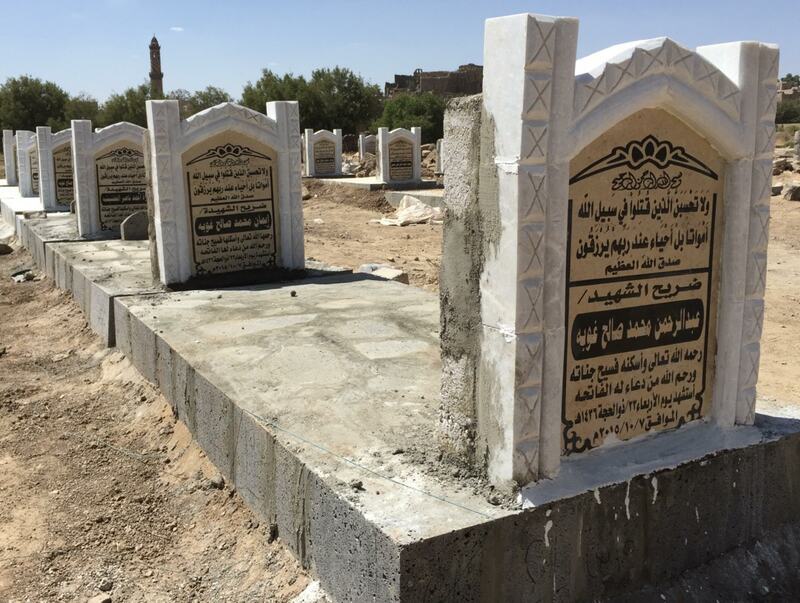 Twenty-six new graves outside the now-ruined home of the al-Sanabani family. All together 43 people died when an airstrike tore through a wedding party on Oct. 7. The al-Sanabani home sits on the crest of a small hill overlooking this village some 90 miles south of the capital, where low-slung houses are clustered near plots of yellowed farmland that are dotted by small trees. In the near horizon, reddish-brown mountains loom over the landscape. On any given day, it’s a beautiful place. It was Oct. 7. Ayman and two of his brothers were all getting married in a joint ceremony. Hundreds of relatives and neighbors had come to take part. Their three-story house was brightly decorated. Colored lights draped down from the roof toward two large tents, which were erected to accommodate the vast numbers of guests. Children scampered outside, shooting fireworks into the night sky. Fighter jets roared overhead but the guests paid little attention to the menacing sounds. Sanaban had never been targeted before. It was considered a safe place. Shortly before 9:30 p.m., the three grooms — 22-year-old Abdel Rahman, 24-year-old Ayman, and 25-year-old Moayad — greeted their brides, who had just arrived in a large convoy from a nearby village. Ayman left the bedroom where his new wife was sitting with her friends. He was climbing up to the second floor landing with his older brother when the missile struck. It was a direct hit, demolishing half the house in an instant. Gas tanks ignited, sending fire blazing through the rest of it. The air quickly filled with black smoke, dust, and screams. The women trapped indoors jumped out of windows to escape. Ayman was blown across the hallway and hurled down the stairwell. He pulled himself up amid the chaos and tried to help others evacuate. He would eventually find out, one by one, that his 18-year-old wife, Gamila; his younger brother, Abdel Rahman; his younger sister, Iman; his father, Mohamed; and his mother, Faiza, were all killed. They were among his 16 family members who died that night, including aunts, uncles, nephews and nieces. Ayman al-Sanabani stands outside the wreckage of his family’s home. The toll was not confined to them. In all, at least 43 people were killed in the attack, including 16 children. Dozens more were wounded, many of them sliced open by flying shrapnel and debris, others severely burned. Among those injured was 15-year-old Abdullah al-Sanabani, a child prodigy who in 2012 won an international competition and a free visit to NASA headquarters for inventing a solar-powered remote controlled car that could flip over and become a boat. He was evacuated for treatment and now lies in a hospital in Boston in critical condition. In addition to undergoing numerous skin grafts, his right arm was amputated above the elbow and the two toes on his left foot were removed. Immediately after the strike, survivors fled the scene out of fear that a second missile would follow, a tactic known coldly as a “double tap.” After 30 minutes of quiet, they went back to start digging out the bodies. With no electricity, they used flashlights and headlamps to work in the darkness. It took until 6 a.m. the next day to pull all the corpses from the rubble. It took even longer to collect the shredded body parts, which they put into plastic bags. A piece of someone’s hand was only discovered three days later. Many of the bodies were either too charred or disfigured for family members to identify, known only by what they were wearing, a distinctive ring or watch. Others were identified through a grim process of elimination, by calculating who was missing. “What can I say? 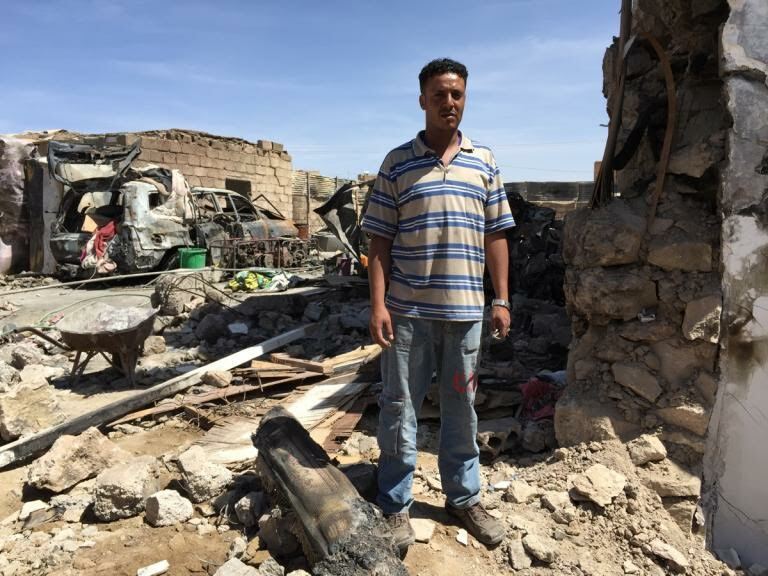 My life has been made into nothing,” Ayman says a month later, standing in the wreckage of his family home. His large green eyes appear permanently bloodshot. He speaks softly, with a mid-distance stare that never seems to focus on anything. Relatives and neighbors — some of them on crutches, others bandaged — whisper that he is not all there anymore, his mind still trying to fathom an unfathomable loss. “If I had burned like them it would have been better,” he says. Down the hill from the wreckage is an open plot of land with 26 fresh graves lined in neat rows. The white and gold headstones label the dead as martyrs. Saudi Arabia has denied responsibility. “We did not have any operations there at that time,” Brig. Gen. Ahmed al-Asiri, the spokesperson for the coalition, told GlobalPost, adding somewhat impossibly that the strike instead came from the local rebel group the Saudis are fighting. There is little rebel presence in Sanaban — no military posts visible in the village, no traces of any ground clashes. Meanwhile, multiple survivors interviewed separately said they heard fighter jets overhead minutes before the attack. Aside from US drones operating sporadically in some parts of the country, the Saudi coalition is the only air power flying above Yemen. 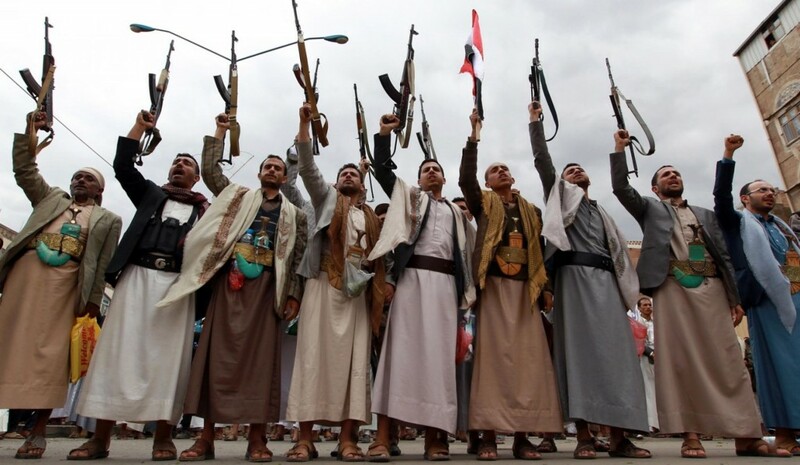 Houthi gunmen brandish their weapons on March 26 in Sanaa. 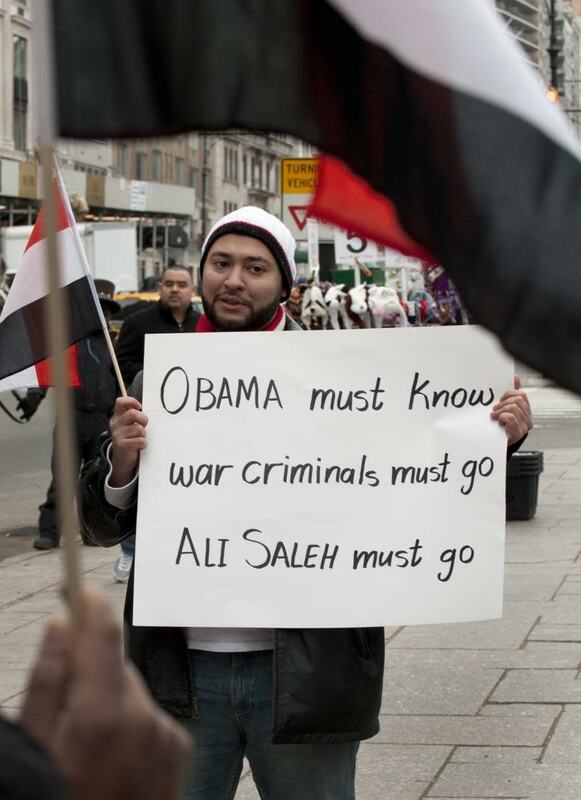 Yemeni President Ali Abdullah Saleh on February 2, 2012 in New York. While Saleh’s guile allowed him to remain in power, it did little to benefit the Yemeni people. They became some of the hungriest and most severely malnourished on the planet. So when Yemenis watched Egyptians and Tunisians take down their own corrupt leaders in the Arab Spring uprisings, they were quick to follow. The Houthis joined them. After securing promises of immunity for his crimes, Saleh finally agreed to step down in November 2011. 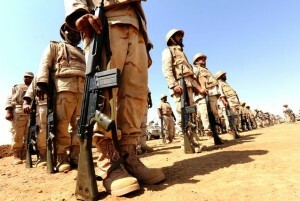 The next day, Saudi Arabia put together a coalition and began its military campaign with support from the United States. 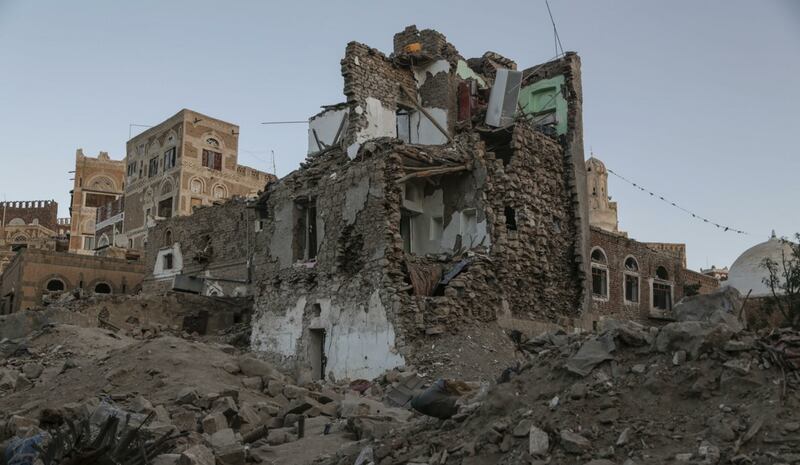 The Saudis and the Americans hoped to restore the friendly Yemeni government they knew. Saudi Arabia also hoped to counter what it perceives as a growing regional threat posed by Iran. Saudi Arabia believes Iran is backing the Houthis, although the level of that support is disputed. More than 5,700 people, including at least 2,577 civilians — 637 of them children — have been killed in the eight months Saudi Arabia has been bombing Yemen, according to the United Nations. The UN expects the actual toll to be even higher because many of the dead or injured never reach medical facilities and so go unrecorded. 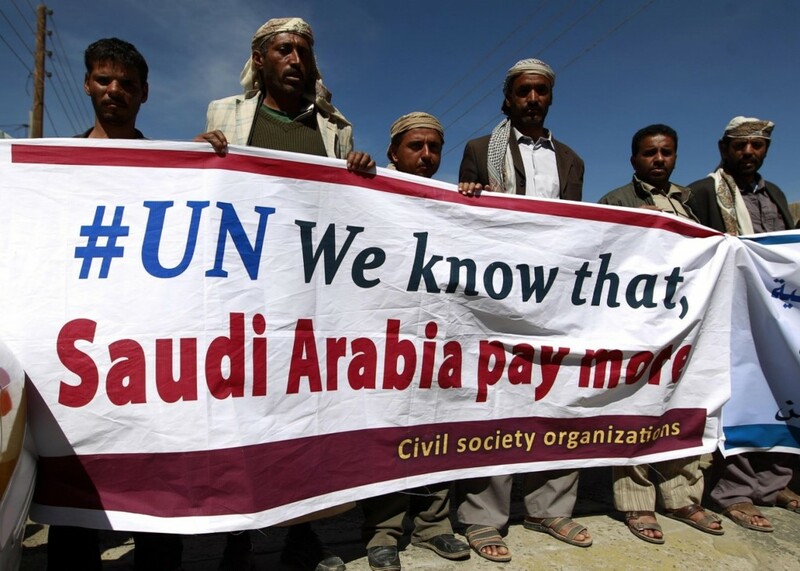 The Houthis and their allies have been implicated in the deaths of hundreds of civilians, often by indiscriminate shelling and the planting of landmines. But the UN says the majority of civilian deaths have come from the coalition’s aerial bombing campaign, which has been relentless. A joint report by the UN’s Office for the Coordination of Humanitarian Affairs and the UK-based charity Action on Armed Violence in September concluded that 60 percent of civilian deaths and injuries were caused by airstrikes. Meanwhile, a report by the Office of the UN High Commissioner for Human Rights found that “almost two-thirds of reported civilian deaths had allegedly been caused by coalition airstrikes, which were also responsible for almost two-thirds of damaged or destroyed civilian public buildings,” the OHCHR spokesman, Rupert Colville, said in a news briefing in September. In Yemen the evidence is everywhere. An airstrike destroyed the home of Hafzallah al-Ayani, a vegetable merchant, in the UNESCO world heritage site of the Old City of Sanaa. An estimated 130 houses surrounding the area were damaged. The entire al-Anyi family was killed as they sat down to dinner. In Sanaa’s historic old city, which has been inhabited for more than 2,500 years, an airstrike smashed into the house of Hafzallah al-Ayani at about 11:30 p.m. on Sept. 19, burying him, his wife and their eight children beneath the rubble of their home. They were sitting together having dinner, the children aged between 4 years old and 17. Three neighbors sitting outside the house next door were also killed. 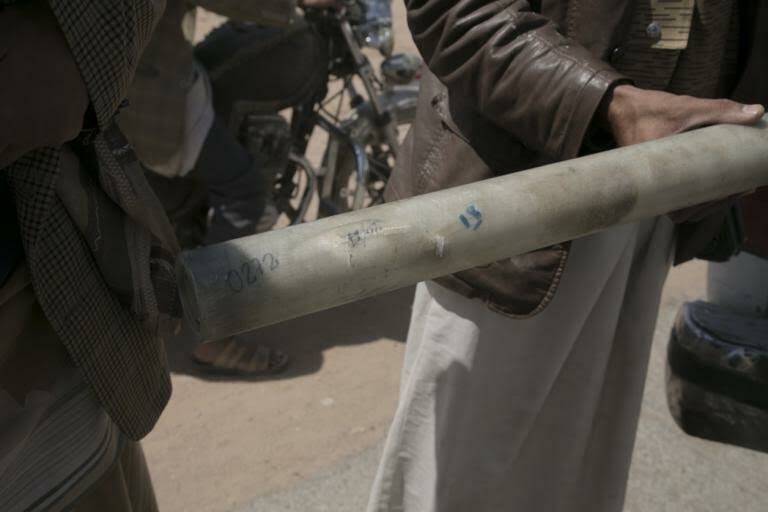 The father of one of those victims, Mohamed Assaba, has kept three foot-long missile fragments as evidence. They are incredibly dense and heavy, with the terrifying jagged edges of bomb shrapnel. All of the surrounding ancient buildings in the al-Felahi neighborhood have been badly damaged, and many of the residents have been forced to leave. 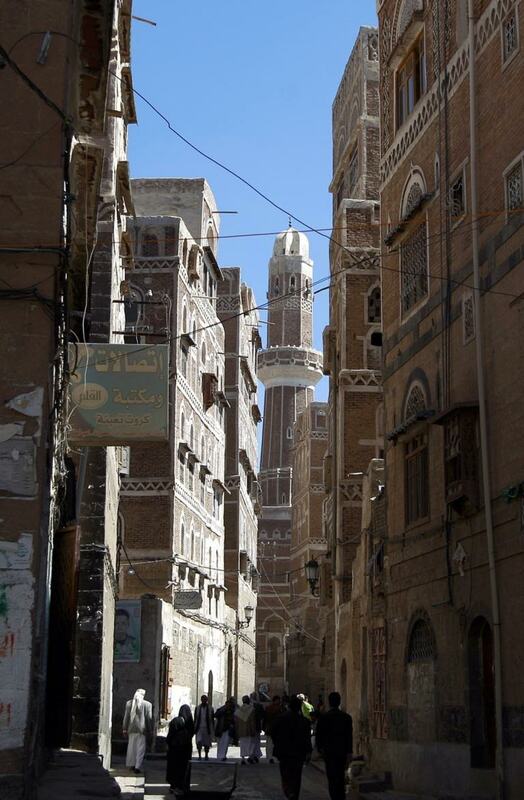 The ancient quarter of the Yemeni capital, Sanaa, which is listed as a UNESCO world heritage site. He describes what happened Sept. 19: An initial airstrike in the distance prompted him to step outside his front door to search the sky for clues. It was then that he heard the warplane overhead, followed by the deafening screech of a missile. He says he didn’t hear the blast, only that he was thrown to the ground. When he stood up the air was filled with dust and smoke. It took him and other residents until 8:30 a.m. the following morning to dig out the bodies. Two of the children still had food in their mouths. Traveling through Yemen’s northern Houthi-controlled cities and towns offers a panorama of the vicious aerial assault. Homes, schools, mosques, retail stores, restaurants, marketplaces, government offices, gas stations, power plants, telecommunications facilities, factories, bridges, roads, and UNESCO World Heritage sites have all been hit. Some of the airstrikes display a high degree of precision. On the road north toward Saada, all four bridges — none of them spanning more than 20 yards in length — were struck directly in the center, causing them to buckle and rendering them impassable. The lack of any visible missile craters nearby indicates they were hit with pinpoint accuracy in a single strike. 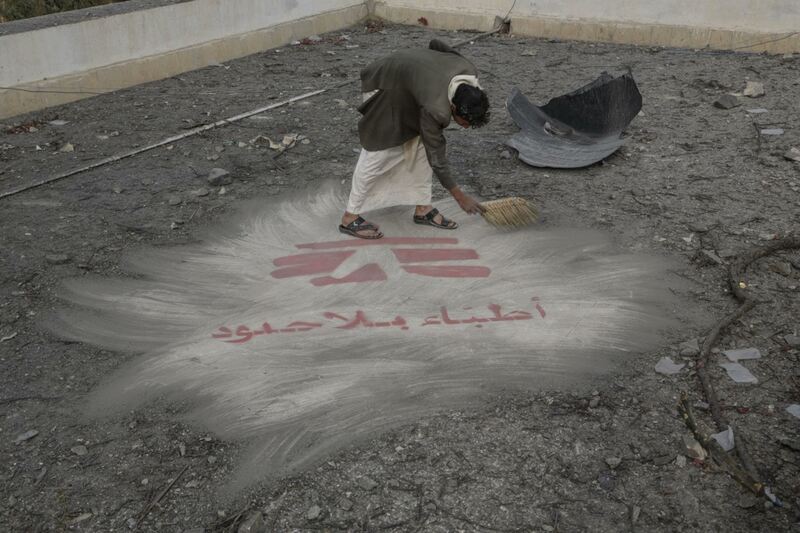 A hospital guard sweeps away debris from an airstrike. The roof of the hospital had been painted with the logo of Doctors Without Borders so that jets conducting airstrikes would know this facility was being run by the international aid organization. But even in war there are rules. Medical facilities, for example, are afforded a special protected status under international humanitarian law, and are supposed to be off-limits from attacks of any kind. On the night of Oct. 26, doctors at the only hospital in Haydan had just finished another arduous day of work. Haydan is a village in the north, less than 20 miles east of the Saudi Arabian border. A man had been brought in that day with severe wounds to his head, shoulder and abdomen. Akram Ghoutheya, an assistant doctor who had been at the hospital for three years, worked frantically for one and a half hours with other members of the medical team to stabilize the patient before sending him to a better-equipped hospital in Saada City, the provincial capital, about 40 miles away. Huddled in Yemen’s northern highlands, Haydan is stunningly picturesque. The mountainous terrain is decorated with terraced farming and is lush with verdant qat trees. Stone houses on hilltops overlook the valley below. The natural beauty, however, is now marred by the bombardments. On the main market street, no building has been left untouched. The airstrikes have damaged every single store. Rooftops have collapsed, facades have been ripped off. Rubble lines the unpaved roads. The town’s school, electrical plant and water infrastructure were all bombed. Most of the residents have fled, leaving the streets desolate. Those who remain stay indoors after sunset. They say not a day goes by without one or two air raids. On some days, dozens of missiles rain down. Located on the edge of town, residents considered the hospital Haydan’s only safe zone. The international medical humanitarian organization Doctors Without Borders (MSF) supported the hospital and regularly shared its GPS coordinates with the Saudi-led coalition. The roof of the facility was clearly identified with the MSF logo. The entryway to the Doctors Without Borders hospital in the northern district of Haydan, Sadaa. The town of Haydan had been repeatedly bombed the week leading up to the attack on the hospital. Nothing remains of the clinic but fragments of rubble and glass. It was around 10:30 p.m. when Akram finally sat down for dinner with about a dozen other staff members in the hospital’s living quarters, located in the back of the building. Minutes later, a missile smashed into the emergency room, not more than 20 yards away. Akram was hit on the head by flying glass and debris but was only lightly injured. Terrified, he helped evacuate the only two patients at the hospital — a father and his infant son — and fled out the back, taking cover in a plot of qat trees as the rest of the staff scattered in all directions. Five minutes later a second strike hit. Several more followed. In total, between three and six missiles targeted the hospital, completely demolishing the emergency room, outpatient and inpatient departments, the lab and the maternity ward. Most of the facility now lies in ruins, reduced to chunks of rubble and twisted rebar. A pack of stray dogs has made it home. They pick their way through the shredded concrete, avoiding the flocks of crows that perch on bent metal gurneys. A family living next door to the MSF hospital that was destroyed in Haydan. Their home was also bombed and is now in ruins. “We have nowhere else to go,” the mother said. The Saudis have offered contradictory accounts of what happened. Immediately after the attack, coalition spokesman Asiri denied that the coalition was conducting airstrikes in the vicinity of the hospital at the time. Hours later, Saudi Arabia’s ambassador to the UN told VICE News that the hospital was hit by mistake because MSF had provided incorrect coordinates. The next day the ambassador reversed his account and denied the coalition was operating near the hospital. When asked by GlobalPost, Asiri would not comment, saying only that the incident was still being investigated. International rights organizations, including Amnesty International and Human Rights Watch, have said the attack may amount to a war crime. While no one was killed in the bombing, the destruction of the hospital will no doubt have fatal consequences. As the only functioning medical facility for miles, it was a lifeline for the surrounding towns and villages and provided medical care for about 200,000 people. At times, the hospital would receive as many as 50 cases or more a day, according to doctors who worked there. The closest medical facility is now the Gomhouri hospital in Saada City, which is about 40 miles eastward on a road that winds slowly through the mountains. The MSF hospital in Haydan is just one of dozens of similar facilities that have been hit. Nearly 70 health institutions have been damaged or destroyed during the conflict, according to the UN. Yemeni men protest outside the UN office in Sanaa on Nov. 2, 2015. It’s easy to see why Akram would think that. In September, UN human rights chief Zeid Ra’ad Al Hussein released a report that detailed the heavy civilian toll in Yemen. He recommended establishing an independent international inquiry into human rights abuses and violations of international law in the conflict. Instead, the UN Human Rights Council passed by consensus a new resolution drafted by Saudi Arabia that made no reference to any independent international inquiry. The text only calls for the UN to provide “technical assistance” for a national commission of inquiry set up by the Yemeni government of President Hadi, which is backed by Saudi Arabia and a party to the war. Smoke billows after an air-strike by Saudi-led coalition on May 11, 2015 in Sanaa. The US military is also advising the coalition through what is known as the “Joint Combined Planning Cell,” which was authorized by US President Barack Obama, according to Capt. P. Bryant Davis, a CENTCOM media operations officer. The joint cell is based in Riyadh, where US military personnel regularly meet with senior Saudi military leadership. In addition to logistical support and intelligence sharing, the joint cell provides “targeting assistance” to the Saudi coalition, though CENTCOM stressed that the “selection and final vetting of targets” is done by coalition members, not the United States. Since the beginning of the war, Human Rights Watch has documented more than two dozen airstrikes that the group said “appeared to be in violation of the laws of war.” The rights group said it has not been able to ascertain that Saudi Arabia or other coalition members are investigating a single airstrike. Meanwhile, the US continues to send billions of dollars worth of weapons to Saudi Arabia and its Gulf allies. Yemenis clear the rubble of houses in the old city of Sanaa, a UNESCO-listed heritage site, on June 15, 2015, after an airstrike. In November, the State Department approved a $1.29 billion deal to replenish Saudi Arabia’s air force arsenal, depleted by its bombing campaign in Yemen. The sale includes thousands of air-to-ground munitions such as laser-guided bombs, bunker buster bombs and “general purpose” bombs with guidance systems. Saudi Arabia has been one of the US arms industry’s most avid customers. Between October 2010 and October 2014, the US signed off on more than $90 billion in weapons deals with the Saudi government, according to the Congressional Research Service. US arms manufacturers have also sold billions of dollars’ worth of material to the other Gulf states that are participating in the bombing of Yemen, including the United Arab Emirates and Qatar. The US continues to send billions of dollars worth of weapons to Saudi Arabia and its Gulf allies. Human rights advocates, however, say the United States should be conducting its own reviews. “If an airstrike takes place, and there’s reason to believe that it was a US bomb that killed dozens of civilians, the US actually has an obligation to investigate that specific strike and we have so far not seen any announcement that the US is carrying out that type of investigative function in any airstrike,” said HRW’s Wille. Hasna Al-Hanash, 3, and her Father. Hasna was injured alongside her grandmother when unexploded cluster munitions fell all around them. The US and other countries have also sold internationally banned cluster munitions to Saudi Arabia and its coalition partners. And those cluster bombs are being used in Yemen. Neither the United States, nor Saudi Arabia — nor any other member of the coalition bombing Yemen — is party to the 2008 international treaty banning cluster munitions. The treaty has been signed by more than 100 governments because of the devastating effects cluster bombs can have on civilian communities. The village of al-Mifaa is essentially a group of mud brick houses nestled in farmland some 10 miles northwest of Saada City. It was there that Hasna Gomaa sat by her 3 year-old granddaughter, watching her play on a swing made of rubber piping and cloth. It was 11:30 a.m. on Oct. 27. She heard a soft boom overhead, though it wasn’t nearly loud enough to be a missile strike. She paid it little mind. What she didn’t know was that dozens of cluster bombs were raining down toward her and her grandchild. Cluster bombs contain dozens of submunitions that are released in mid-air and scatter indiscriminately over a wide area. The bomblets fell all around Gomaa and her granddaughter. One hit the tree branches above them while several others exploded next to them. Three-year-old Hasna, named after her grandmother, was thrown off the swing as shrapnel flew into her leg. The elder Hasna was also hit, with shrapnel slicing through her right thigh and left ankle. One of the tubes used to carry sub-munitions in cluster bombs, found in Saada. They were both bleeding profusely. The girl’s father, Mohamed Ahsan, rushed outside and carried his daughter and mother into a nearby hole the family had dug to escape airstrikes. They wrapped little Hasna’s leg in a scarf to try to stem the bleeding. The family stayed crouched in the makeshift bomb shelter for several harrowing minutes, unsure if another attack would come. When Hasna fell unconscious they climbed out to rush her to a nearby hospital. Three days later, Mohamed is holding little Hasna outside their house. Her left leg is wrapped in thick bandages and she cries out in pain when he shifts her in his arms. Her grandmother and namesake limps beside them. “If I had died it would have been OK, but not her,” she says. Abdel Aziz al-Nahari was not as fortunate. The same cluster bombs sent shrapnel into his chest and abdomen and he began to bleed internally. He now lies on a cot in Saada’s Gomhouri hospital. The right side of his body is bandaged from armpit to thigh. He is too frail to talk. A tube protrudes from his chest, draining blood. He has undergone three operations and needs additional surgery to remove the shrapnel still stuck inside him. Faisal al-Hanash saw the bombs exploding in the sky. He says metal pipes filled with bomblets that came out of two separate rockets were spinning as they fell through the air, spreading their deadly cargo over at least a square mile. He holds up one of the meter-long pipes as proof. “This is an illegal weapon, why are they using it on us?” he asks. The cluster bombs landed all over the farmland where the family grows cucumbers, tomatoes and pomegranates. Many ripped holes through the thin plastic sheets that cover crops before exploding on the ground, destroying some of the plants. Damage from shrapnel like this is evident in several parts of the village. 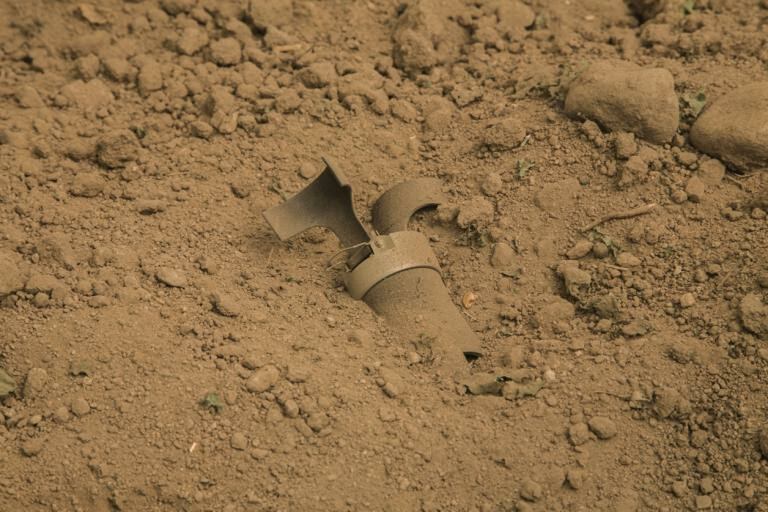 A cluster munition believed to be made in Brazil lies half buried in a cucumber field in Sadaa, Yemen. Cluster bomblets have a high “dud” rate — meaning a high percentage of them fail to explode on impact and become de-facto mines. Residents of the village of al-Haneya, which is close to al-Mifaa, say dozens of cluster bombs landed on their farmland days before on Oct. 21. They had no choice but to try to remove them if they wanted to farm their crops. Nineteen year-old Ahmed Gomaa was trying to push an unexploded bomblet away using a long stick when it exploded. He was hit with shrapnel in the forearm and leg and now walks with a crutch. “I was afraid but I had to do it to be able to work,” he says, lying down in his family house. “People continued trying to remove them even after I was injured.” His father, Abdullah Gomaa, sits beside him. 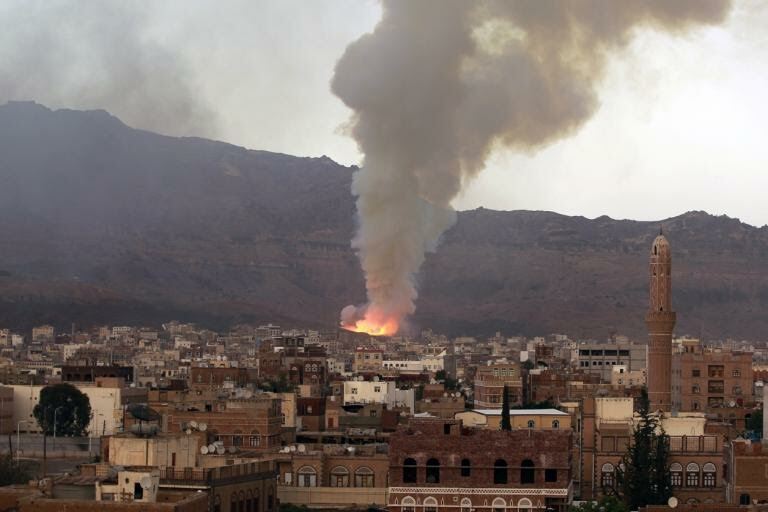 While human rights groups and the UN have repeatedly warned of atrocities in Yemen, the conflict shows no signs of relenting. The exiled president has lost credibility across the political spectrum and Saudi Arabia’s stated goal of returning his government to rule is unrealistic at best. The coalition has forced the Houthis to retreat from some southern areas, including the port city of Aden. But fierce ground fighting is ongoing in cities like Taiz and elsewhere. Neither the Houthis nor the Saudis appear capable of securing a clear military victory over the whole country. In the mean time, groups like Al Qaeda and the nascent Islamic State are taking advantage of the power vacuum. Al Qaeda now controls Yemen’s fifth-largest city. With no obvious exit strategy, the coalition continues its heavy bombing. 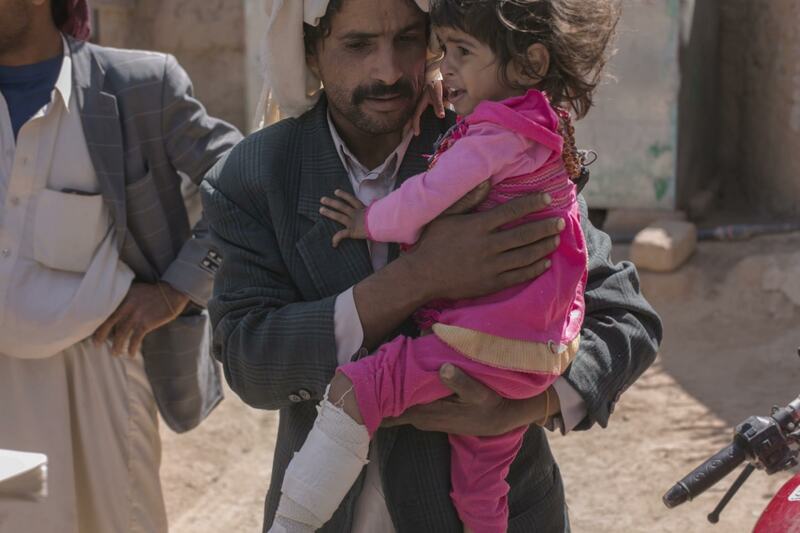 Yemenis feel the international community has forsaken them. They say the world’s media has largely ignored them. 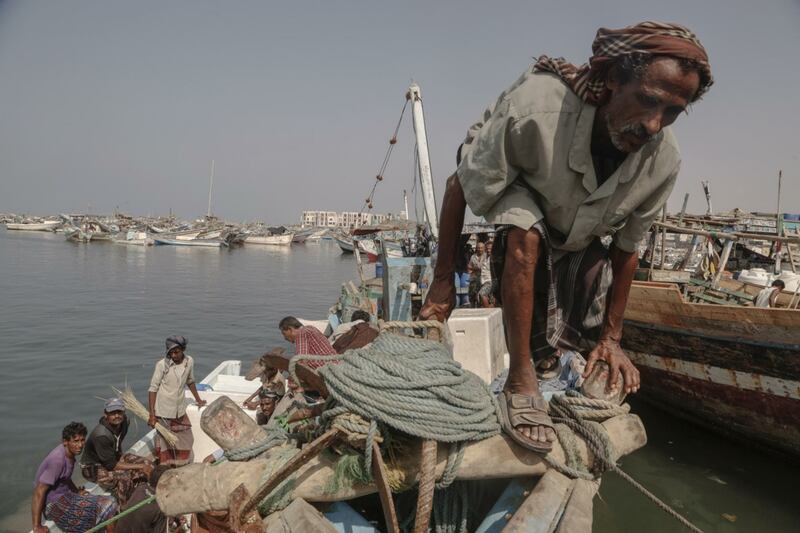 Hudeidah, the country’s fourth-largest city, and home to 400,000 people, is world-renowned for its fishing industry. But its fishermen are now the targets of airstrikes. One of the deadliest attacks by the Saudis in recent weeks received hardly any coverage in the foreign press. It took place not on Yemen’s mainland but at sea. The small Red Sea island of Aqban, some 25 miles west of mainland Yemen’s coast, is shaped like a diving whale. Protected from the open sea by a coral reef, its crystal blue waters provide the ideal sanctuary for Yemeni fishermen to anchor and rest when heavy winds come in. This is where Abdo al-Baghawi’s boat was headed on the morning of Oct. 22. Al-Baghawi is 52. He has a wiry frame and a bushy beard. He’s been fishing these waters for 30 years. It had been an unremarkable night’s work. The crew of a dozen or so men had set out on a zawraq — a traditional, wooden Yemeni boat — just before sunset the day before and fished all night, as is their routine. On the boat with Abdo was his cousin’s son, Ali, whose hazel eyes and boyish looks made him appear far younger than his 39 years. Mohamed Suleiman, a compact 26-year old who lived in a neighboring village, was also with them. Other zawraqs were working not far away. Most of the men aboard were from a cluster of villages near Beit Faqih, about 40 miles southwest of the port city of Hudeidah. They had all fished alongside each other for many years. After daybreak they hauled in their nets and set course for the island, where they would sleep through the morning and afternoon before fishing again the following night. They reached Aqban at about 10 a.m. There were at least seven other zawraqs and a couple dozen smaller wooden skiffs accompanying them. The small flotilla dropped anchor in the calm waters a few hundred meters from shore. Abdo lay down to rest with the others. The fishermen were fast asleep when the first missile struck, violently yanking them out of their dreams and into a living nightmare. The first airstrike hit the boat adjacent to Abdo’s at about 11:30 a.m., shattering the hull into small fragments of broken wood. “Like a deck of cards being thrown in the air,” is how Mohamed later described it. Jolted awake, Abdo looked around in horror and confusion. There was nothing left of the boat next to him but the fishing net. Seventeen of the 20 men on board had been killed. He heard two men screaming but he couldn’t see any bodies in the water. 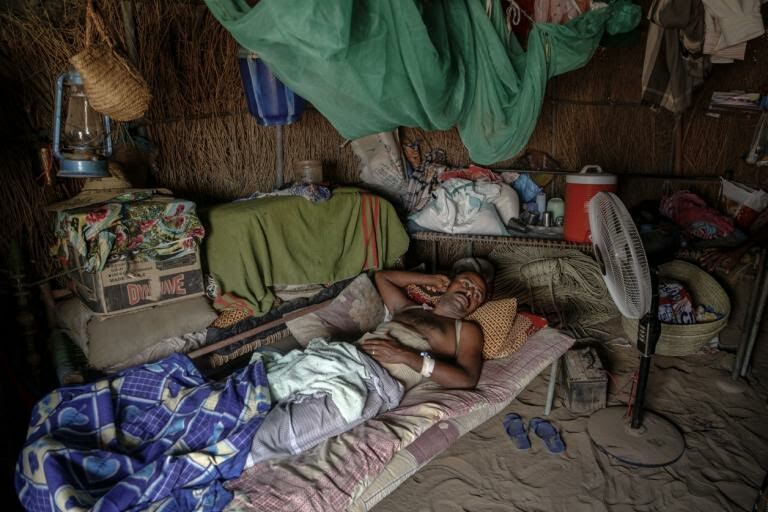 Mohamed Suleiman lies convalescing in a hut in his home village near Beit al-Faqih in Hudeidah province. His spine was partially broken when coalition warplanes targeted the fishing boat he was sleeping in on Oct. 22. At least 42 were killed in the attack. He didn’t know whether to jump in the sea or try to sail away. Amid the panic, a crewman shouted, “the next strike will be for us.” They all said the shehada — the Muslim affirmation of faith that is recited when one expects to die. Moments later the second missile slammed into them. Abdo found himself under water. He didn’t know what was happening. His foot had been fractured but the pain didn’t register. He said another prayer and surfaced. The bow was all that remained of the zawraq. He swam toward the wreckage trying to find other survivors, screaming names but no one answered. Eight of the thirteen men on board were dead. He decided to swim for Aqban. Then he saw Ali and a few others not far away also struggling to make it to the beach. With two boats destroyed, the fishermen on the remaining vessels were scrambling off of theirs, diving into the water in a panic before the next strike. Mohamed was also blown into the water by the force of the blast. Something was wrong with his back and he couldn’t move properly. Struggling to stay afloat he grabbed onto a piece of wood and looked around. There were corpses floating next to him. One man was decapitated. Another man had his arm torn off. His spine partially broken, Mohamed clung helplessly to the floating debris until a skiff finally picked him up and took him to shore. The men all collapsed on the beach. The pain from their injuries now made itself known. Some were burned and screaming in agony. Many of them couldn’t walk and were crawling on the sand. Ali, whose right knee was broken and left thigh split open, passed out. The air assault did not stop. For the next hour and a half, missiles rained down every 10 minutes, destroying the remaining boats and pounding the island itself. After about five strikes, Abdo said he saw an Apache helicopter swoop in and strafe the shallow waters 30 meters from shore, killing at least one of his colleagues, Mohamed Abdullah Hadi. At about 1 p.m. the assault finally ended. Other fishing boats eventually arrived to evacuate those left alive. At least 42 fishermen died in the attack. The Ministry of Justice in Houthi-controlled Hudeidah listed their names in a report. The report, obtained by GlobalPost, documented the casualties from four of the boats. The International Committee of the Red Cross confirmed the toll. Many of the bodies were only found days later, floating off the islands. Photographs of their corpses show them grotesquely bloated and disfigured. Ali al-Baghawi worked as a fisherman for 21 years. He was injured in an aerial attack at sea that killed dozens of his friends and colleagues. Though fishing was his livelihood he now says he will never return to the water. “Only God knows why they attacked us,” Ali says. “Can’t they see us with all this surveillance technology?” His arm is scarred by shrapnel and his right leg is wrapped from thigh to ankle, the bone held together by clamps attached to a protruding metal rod. A fisherman for 21 years, he now says he feels nauseous when he thinks of the sea and will never go back. Saudi Arabia claimed the seven boats were smuggling weapons and military equipment. It released aerial footage showing the boats in the water and one of them being destroyed in a massive airstrike. “We are sure 100 percent that they were smuggling weapons from the big ships to small boats,” Asiri, the coalition’s spokesman, told GlobalPost. Survivors interviewed separately say they never saw any weapons on Aqban and that there were no boats among them other than fishing vessels. They say the small skiffs routinely accompany zarwaqs when going out to fish. In Hudeiah’s harbor, scores of skiffs can be seen anchored near the larger boats. Sharif Abdel Kouddous is a fellow at The Nation Institute. Additional reporting for this piece was provided by Amal al-Yarisi.